The shuttle to and from the train has been crazy lately. I actually watch as people position themselves to get on first, even though they see a bunch of us have been waiting before they came out. Y’all know I have considered clipping a few of the rude ones. Ooops…my bad. lol. They do this because the shuttle has been packed and many don’t make it on. And, the driver announced today they can’t allow people to stand anymore. So, I anticipate the aggressiveness is about to be turned up a notch. Luckily for me, the weather is nice enough to start walking again…so I thought. I used to walk to and from the shuttle regularly last year. So, I was like – I have my tennis shoes today…forget those shuttle folks. That all seemed like an excellent idea until I hit the incline…right outside the building. I had to nerve to start leaving someone a voicemail right before the incline began. Maaaan, let’s just say they may be reporting me right now for sexual harassment ’cause my breathing was hella heavy by the last sentence. I don’t know why I didn’t just act like I got disconnected. Back to that incline – by the time I hit the peak, I was wishing I had a medical alert bracelet. I near ’bout died! LOL I was gasping for air and mad at myself for wearing these black pants and not taking off my sweater before leaving. See it was 50 degrees when I left this morning so I was still dressed for that instead of the 82 degrees I was met with this afternoon. I could’ve sworn smoke was starting to bellow between my thighs. And, I was way too close to a bunch of dry trees lining the path. I most certainly did not want to disappoint Smokey Bear. 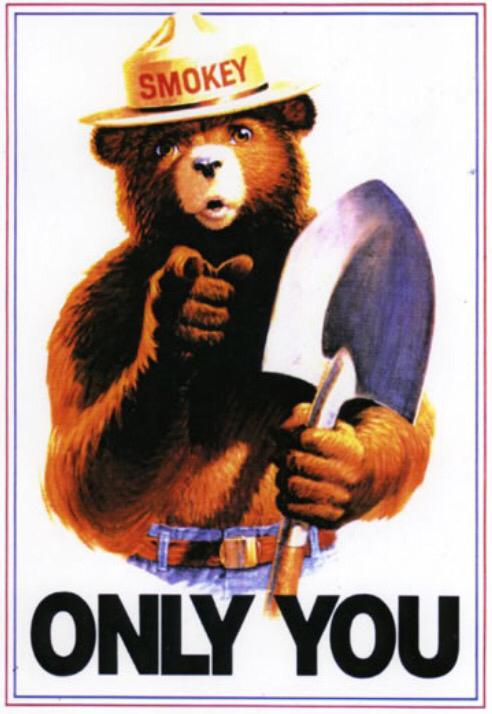 When I was little, he told me, “Remember ONLY YOU can prevent forest fires.” And here I was on the verge of disappointing Smokey and having “spontaneous combustion” listed as cause of death on my certificate. To avoid all of that, I slowed my pace. The rest of the terrain (yes terrain!) was relatively flat and I finally made it to the train without needing CPR. Needless to say, I have really gotten out of shape during the cooler seasons. That could explain why none of my clothes fit.